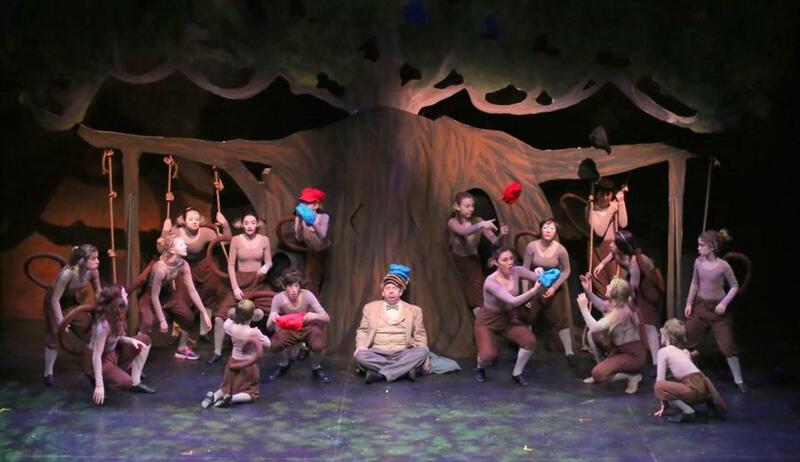 Steve Gagliastro as Pezzo, surrounded by a cast of young actors portraying monkeys. They’re just 50 cents a cap, so you’re reminded the book was written quite a while ago. Seventy-six years, to be exact. That “Caps for Sale” is a timeless classic of children’s literature is confirmed when the mother of the little peanut sitting next to you says they’ve already read the book 20 times. Somewhat surprisingly, the Boston Children’s Theatre new production of Esphyr Slobodkina’s unforgettable tale is a world stage premiere. Adapted by Gabriel Carbajal and Paul Lewis, it’s embellished considerably, turning a picture book of 48 repetitive pages into a 90-minute performance, with a narrator, rolling set design, several original songs, and a guy on stilts, among other spectacles. In the book Pezzo, the hat peddler, tramps around the woods and mountains of the Old World with his wares stacked high atop his own patchwork cap, just as his father and grandfather did before him. Based on a traditional Russian folktale, the story features one major obstacle to Pezzo’s efforts at salesmanship: a troop of light-fingered monkeys, who pilfer his hats while he’s snoring and won’t give them back. The BCT adaptation, directed by Burgess Clark, the theater’s executive artistic director, unspools the yarn with detours into a glum Gothic mountain town and the camp of a failing traveling circus. How Pezzo (played with relish and an accent borrowed from Father Guido Sarducci by local stage veteran Steve Gagliastro) manages to introduce his larcenous monkeys to the joyless townspeople and the hapless circus performers is a trick nearly as precarious as Pezzo balancing all those brightly colored caps atop his dome. But the company pulls it off, with a couple of vaudevillian set pieces and a little help from the crowd. At stage right, a mother (Shayna Bredbeck) cradles her young daughter on a stormy night and begins to tell her a tale that’s “true and make-believe all at once.” In her story, there’s a young girl living in the miserable town — “Never have I been to such an unhappy place,” Pezzo exclaims — who sees a glimmer of hope in the visiting peddler and the colorful things he brings. By the end of the show, it’s clear the mother hasn’t just plucked her story out of thin air. The monkeys arrive after an intermission, and they bring the mayhem the audience has been anticipating. Played by a cast of young actors in brown flannel and big floppy ears, Pezzo’s tormentors spring and tumble around the stage in an inspired bit of choreography. Ultimately, the show builds on the source material’s simple message about ingenuity — how Pezzo gets his caps back from the monkeys — to offer a larger takeaway about the power of every ordinary person to do something extraordinary. For starters: You hold your head up, like Pezzo does.